getcalc.com's Future Value (FV) Calculator is an online finance tool to calculate the time value of money at a specified date (future value) for the present sum. Future Value is a finance function or method used in the context of time value of money calculation, often abbreviated as FV, represents the time value of money at a specified future date to unveil what would be the present sum value at a specified future date. 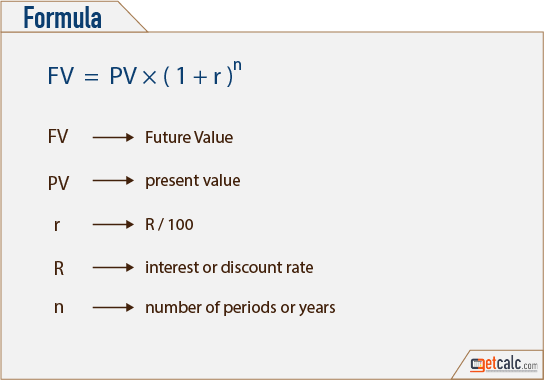 Generally, a certain rate of interest will be accumulated periodically to the present value of sum until the specified future date.